Erailug, an old friend, was one of five navigator initiates in the Pwo ritual which I filmed on Lamotrek Atoll in 1990. He is seen here holding a wooden dance stick that he referred to as his man, a word which roughly translates as "power". 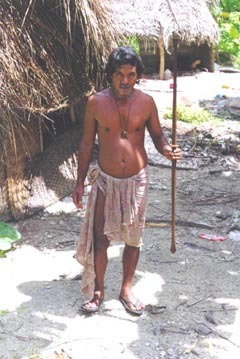 The dance stick is one of the few possessions which was handed down to him after the death of his father, Repunglap, a renown navigator who helped to re-discover with his navigator brother, Repunglug, the sea lanes between Satawal and the Mariana Islands (Guam and Saipan) in the early 1970s. The general name for dance sticks is gurugur after the name for citrus tree, which is the wood that is commonly used for making dance sticks. The best wood is gaingiy "iron wood" from which Erailug's dance stick was made, now rare. See also photo "Men's Stick Dance on Satawal Island".